The past week was a really busy one for me. In addition to seeing three different levels of Phillies (AA, AAA, and majors), my son had two baseball games, and the cold water valve in my laundry room broke, sending a geyser of water all over, and down through the floor vent into the finished basement. Fortunately, it broke while I was in the act of turning it on, instead of when I was unaware and off doing something else, so I was able to find the main shutoff valve without too much panicking and minimal water damage. On the plus side, the floor behind my washer and dryer is now cleaner than it’s been in years! This entry is going to be a bit long, so please bear with me. The IronPigs held the first of two Education Days scheduled for this month. Education Day just means that the game starts at 10:35 am, and there are lots of school groups in attendance. My own children were, in fact, at school that day; we just had lots of other people’s kids surrounding us. Leadoff batter Rich Thompson looks very serious in this rendition. In need of a little Prozac? Luis Maza, on the other hand, looks quite happy. Has John Mayberry been getting the Michael Jackson treatment? He looks a bit pale. This artist even included Andy Tracy’s stubble. Neil Sellers could be forgiven for going 0-for-4 today, since it looks like he might have trouble seeing straight. Paul Hoover looks rather demonic. Hoover has just been called up to the parent club to replace backup catcher Brian Schneider, who is currently on the DL. Brian Bocock, that is not a good batting average! Drew Carpenter, hitless so far this year (he didn’t get one this day, either). Dewayne Wise needs a neck reduction! Final score: IronPigs 3, Indians 1. Finally, my first Phillies game of the season! Not only that, but we had some amazing seats (thanks, Eric and Michelle! ), just past the Phillies dugout in the fifth row. We missed the first inning, however, due to absolutely nightmarish traffic resulting from simultaneous Phillies and Flyers games. I hate when (hmph!) secondary sports like hockey interfere with my plans! Danys Baez and Jose Contreras pitched perfect eighth and ninth innings, respectively, to close out the victory for Kendrick. Final score: Phillies 4, Cardinals 0. The Reading Phillies were holding their annual Spam carving contest this past Saturday. I had no intention of taking part in this, I just simply planned on snapping a few photos of other people’s Spam creations. My daughter, motivated by the prospect of the $250 prize, had other plans. At her urging, I handed over the $5 entry fee (proceeds benefitting a charity called Opportunity House) and we received our can of Spam. What to carve? I was a bit unprepared, as I’ve mentioned, this was not part of my original plan. We decided upon the R-Phils mascot, Screwball. Step one: figure out how to get the Spam out of the can intact. Eww. My experience with Spam ended many years ago during childhood, when my mom would occasionally serve it. I have never willingly touched Spam since then. Let’s just say it’s a bit, um, slimy. Best not to think about what’s actually in it. It’s also not the easiest medium to work with. And after your hands are covered with Spam juice, it’s not easy to control your carving utensils (a plastic knife and toothpicks). OK, so not a perfect likeness, but like I said, Spam isn’t the easiest thing to work with. Prior to the winner being announced after the seventh inning, judges narrowed the entries to six finalists. Ours was one of the six! Fans then cast their votes for their favorite. The finalists got to walk out on the field accompanying their entry. Sadly, I do not have any pictures of this, since I was on the field and couldn’t very well take a picture of myself. The winners, pictured above, got the cash, and the rest of the finalists got a cap and t-shirt as consolation prizes. My daughter claimed the cap, since the shirt was extremely large and would have looked like a dress on her. I only managed a few pictures of the game, as it was incredibly windy and cold, making it hard to hold the camera steady. The R-Phils lost, 5-2, though we left before then since it was so windy and cold. The kids didn’t even mind missing the post-game fireworks, they were so uncomfortable. Whew! Now I’m caught up. Hope to be blogging more regularly this month. 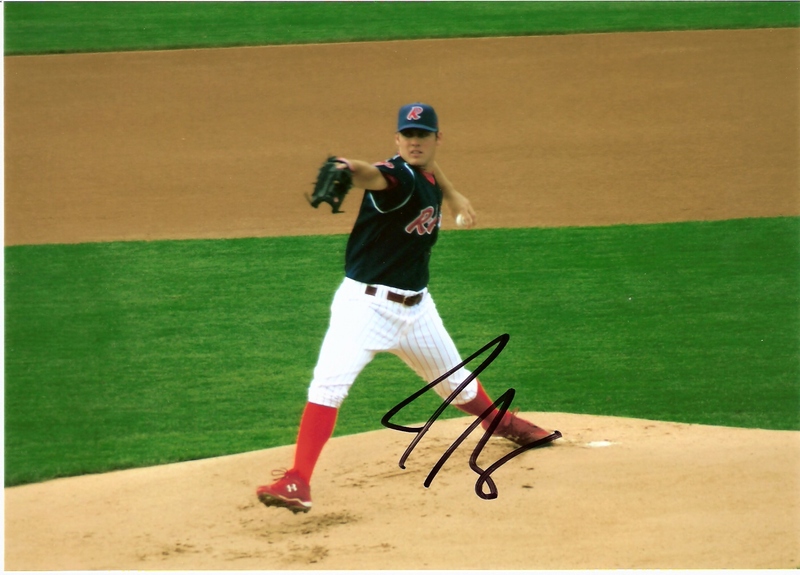 Towards the end of the summer, I decided to pick out some of the better pictures I’d taken at Reading Phillies games this year, and see if I could get them autographed. This isn’t too difficult an endeavor at Reading – obviously it’s much smaller than major league ballparks, and the players have to actually walk across the public concourse to get from the clubhouse to the field. Out of eight photos, I managed to get four of them signed. Judging by the resulting signatures, baseball players do not place much of a premium on good handwriting. Their grade-school teachers would be appalled! Good thing these signatures are on photos, and not something generic, like a ball. Otherwise, I might be hard-pressed after a few months to identify the player in question. Here they are, in descending order of legibility. Sergio at least seems to have tried to get most of the letters in there. The S and E are pretty obvious, accompanied by a bunch of other squiggles. Sergio has since been called up to the parent Phillies, to help bolster the injury-plagued bullpen. Good luck Sergio! Kind of curvy and pretty (the signature, not the player), but it would be impossible to read if you didn’t know what it was. Quintin was named to the Eastern League’s Mid-season and Post-season All-Star squads (apparently they have two), and just missed (by one base) leading the league with stolen bases, with 48. 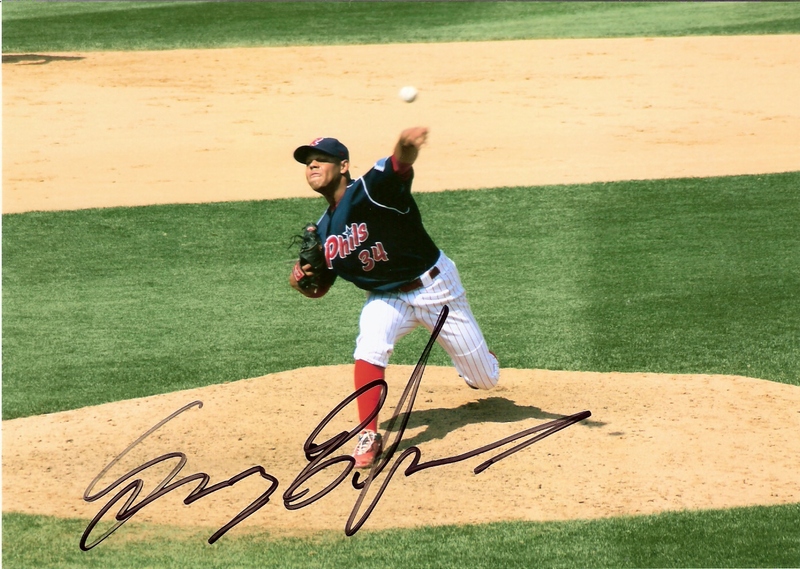 One of the Phillies’ top prospects, Domonic seems to be going the “initials” route with his signature, with the D and B seeming to be all that’s there. Brown began the season at single-A Clearwater, and was promoted to double-A Reading mid-season. He will likely play in the Arizona Fall League. OK, I’ll give him the J, but the other part doesn’t even resemble an S. If this weren’t on a photo, I might think one of my kids was scribbling just to see if the pen was working. Joe was also named to the Eastern League Mid-season and Post-season All-Star squads, and was promoted to triple-A Lehigh Valley at the end of July. Not too many of you were feeling creative for my last caption contest, but nonetheless I’ve chosen my favorite. Thanks to Julia of Julia’s Rants! Blah. That’s how I’ve been feeling lately. The Phillies certainly haven’t been doing anything to inspire me. After being swept by the Mets last week in that short two-game series, they dropped two of three to the Braves over the weekend. Thankfully, they didn’t play yesterday. I’ve also discovered that I seem to be on the opposite schedule from most of you – while other bloggers seem to post more on the weekends, I often don’t have an opportunity to blog until the kids are back to school on Monday. Now I’m trying to get caught up on all the entries I missed reading over the past few days! Not that I didn’t do anything baseball-related over the weekend. We were actually quite busy. Right after her game, my 10-year-old son had a baseball game. He pitched two innings in this game – his first inning was great, retiring the side in order, but things kind of fell apart his second inning. He almost squirmed out of a bases loaded jam with no outs, getting two strikeouts, but it was not to be. One of the things I don’t like about taking pictures at their games is that there always seems to be a view of the parking lot behind the action. There are very few angles I can shoot at which won’t have a car in the background. Aargh. Later, we went to see the Reading Phillies host the Altoona Curve, double-A affiliate of the Pirates. Each year the league my kids play in has a night at Reading where they get to walk around the field on the warning track prior to the game. For even more fun, there were fireworks after the game. Actually, he has just drawn a walk, and dropped his bat, although I caught it before it hit the ground. R-Phils catcher Tuffy Gosewisch. Seriously, can you imagine someone named Tuffy as an accountant, doctor, or a lawyer? I think not. Although the R-Phils dropped this game by a score of 4-2, the fireworks after the game more than made up for the lack of fireworks during the game. The big-league Phillies are back in action tonight, as they begin a three-game home set against the Manny-less Dodgers. As Manny is currently serving his suspension, I will be spared the sight of him with that mouthpiece spending more time out of his mouth than in.